All of our appetizers are served with cilantro and mint chutney. Eggplant smoked on an open fire, pureed and mixed with tahini sauce and our own special dressing. Served with pita bread. The original Middle Eastern dip: garbanzo beans, tahini sauce, and a special dressing. Served with pita bread. Two crispy pastries filled with freshly mixed vegetables. Two crispy pastries filled with delicately spiced lean ground beef or lamb. A medley of vegetables, herbs, and spices formed into patties, lightly breaded and sautéed. Delicately spiced fried fritters, lightly battered in chickpea flour. Lightly breaded calamari fried crisp and served on a bed of lettuce. Fresh grape leaves stuffed with seasoned rice, onions and delicate spices. Crispy onion fritters battered with chickpea flour and bounded by subtle spices. Tender cubes of Indian cheese marinated with delicate spices and roasted in the Tandoor oven. Boneless chicken marinated in yogurt, herbs, and spics. Served on a bed of lettuce. Spicy chicken wings roasted in the Tandoor oven. Combination plate of samosa, chicken pakora, chicken tikka, and beef kabob. Combination plate of vegetable samosa, paneer pakora, vegetable pakora, vegetable cutlet, and dolmas. All our salads come with Mediterranean, blue cheese or ranch dressing. A salad made of chopped parsley leaves, tomatoes, green onions, cucumbers, bulger wheat, and our own dressing. Garden­fresh greens, tomatoes, and cucumbers. Garden-­fresh lettuce, tomatoes, olives, cucumber, feta cheese. Fresh Romaine lettuce prepared with a classic Caesar dressing. Cucumbers mixed with yogurt, olive oil, and a touch of garlic. Onions, tomatoes, cucumbers, green chills mixed in a tangy sauce. A medley of seasoned fresh vegetables and spices, simmered together with red lentils. A medley of chicken and spices, simmered together with red lentils. Made of fresh spinach and spices, simmered together with red lentils. A pleasant blend of mild spices and seasoned lamb, simmered together with red lentils. A pleasant blend of mild spices and seasoned beef, simmered together with red lentils. Aromatic deep fried chucks coated with spiced batter and decorated with curry leaves. Grounded lentils with onion and chilies, flourished with Indian spices. Served with chutney and Sambar. Mixed vegetables with think lentils and spices soup. Fermented pancake made from rice batter and black lentils. Served with chutney and Sambar. Fermented pancake made from rice batter and black lentils. And filled with potato masala. Served with chutney and Sambar. Battered and sautéed with green chilies, ginger, garlic in our signature Manchurian sauce. All of our Indian cuisine is served with basmati rice. Traditional brown curry prepared with tomatoes, onions, and fresh herbs. Rich curry, cooked with coconut, ginger, garlic and our special blend of spices. Sautéed with Major Grey Mango Chutney and a touch of cream. Cooked in a traditional Indian wok with red onions, tomatoes, fenugreek leaves, capsicums, fresh ginger, and garlic. Stir­fried in brown curry with bell peppers, garlic, ginger, tomatoes, and onions. This famous dish from Kashmir is cooked with tomatoes and onions, and then roasted with spices in a rich brown curry sauce. Distinctive green curry, made with cream, homemade yogurt, and cilantro. A distinct curry made with tomatoes, lemon, onion and spiced vinegar. Hot, spicy, and mouthwatering! A blend of green chilies, herbs and spices, fresh ginger, and garlic, stir­fried with bell pepper, tomatoes, and onions. A traditional dish prepared with exotic spices, herbs, and a cream­based sauce with almonds. Delicately spiced apples, almonds and chicken mixed with raisins in a distinctively creamy curry. A deliciously smooth butter, tomato, and cream sauce. A classic Mughlai dish of Basmati rice cooked with curry, raisins, cashew nuts, and saffron. Served with Raita. This dish originates from the city of Madras. Cooked in a sauce of tomatoes, roasted dry chilies, browned garlic, cumin, and other authentic Indian spices. Cream of spinach, simmered in onions and spices. A cream­based curry, cooked with ginger and cilantro in a tomato sauce. Fresh vegetables and paneer, in a cashew nut­cream sauce. Delicious yellow lentils cooked and simmered with onions, tomatoes, and garlic, then topped with fresh chopped coriander leaves. Fresh green peas, cooked in a tomato sauce. 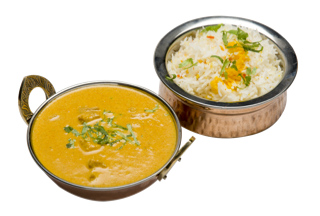 A cream-­based curry, cooked with sautéed onions, tomatoes, special herbs and spices. Fresh goat meat, cooked in an onions, garlic, and ginger sauce with fresh tomatoes. Chicken simmered in a delicious sauce with tender garbanzo beans. Lentils, cooked with select herbs and spices. Yellow lentils cooked with tomatoes, onions, garlic, ginger and fresh herbs and special. Potatoes and cauliflower, sautéed with onions and fresh herbs. Puréed vegetables and cheese kofta, served in a tomato sauce. A blend of fava beans, chickpeas, parsley, and spices, deep­fried to a golden brown. Garnished with cucumbers, tomatoes, and tahini sauce. Served with pita bread. Another customer favorite! A combination of hummus, baba ghannoj, and falafel. Served on a bed of lettuce with pita bread. Our customers’ favorite! A combination of hummus, baba ghannoj, falafel, dolmas, and tabboleh. Served with pita bread. Strips of marinated beef, sautéed with onions. Served on a bed of lettuce with pita bread. Cubed chicken marinated in garlic, oregano, saffron, and other Middle Eastern spices. Served on a bed of rice with fresh vegetables. Tender fillet of lamb, marinated in a special sauce, skewered with onions and tomatoes. Served with rice with fresh vegetable. Fried crispy pastries filled with fresh mixed vegetables and sprinkled with channa masala and chutneys. A medley of patties filled with fresh mixed vegetables, herbs, and spices and sprinked with channa masala and chutneys. Crispy crackers served with potatoes, yogurt and homemade chutney. Spiced lentil balls coated with yogurt and mixed with onions, green chilies and cilantro. Large puffy bread, served with channa masala (One Piece). All dishes served with rice, naan, samosa, raita, salad, and desert. Dessert Option: Kheer or Gulab Jamun. Not available for take-out or delivery. Lamb Curry, Chicken Curry and Tandoori Chicken. Tandoori Cuisine is an ancient method of cooking. Using a clay oven called a Tandoor, we cook our meats to absolute perfection. All of our tandoori dishes are served with Basmati rice, fresh vegetables, sliced lemons, onions and served on a sizzling plate. Tender pieces of Indian cheese, marinated in delicate spices, then roasted in the Tandoor. A medley of fresh herbed, seasonal vegetable and paneer cooked in our tandoori oven. Juicy spring chicken marinated in flavorful, freshly ground spices. Succulent pieces of boneless chicken, rubbed with Indian herbs and spices. Boneless chicken marinated with Indian herbs and spices and apple. 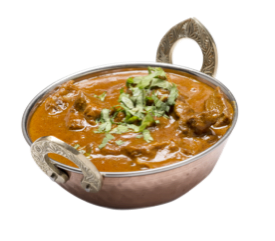 Tender pieces of lamb, marinated with our special blend of Indian herbs and spices. Rack of lamb roasted to perfection in the Tandoor. Lamb chops marinated in yogurt, garlic, ginger, and spices. Served with our delicious mango sauce. Ground beef with onions and fresh herbs. Jumbo prawns marinated in a special blend of spices and herbs, and then roasted in the Tandoor. Fresh marinated fillet of cod cooked in the Tandoor. Fresh salmon is marinated in fresh herbs and cooked in our special Tandoori. An assortment of Tandoori specialties: chicken, lamb, beef and fish. Can’t decide? Try our sampler platter of lamb boti, rack of lamb, chicken, cod, and prawns. 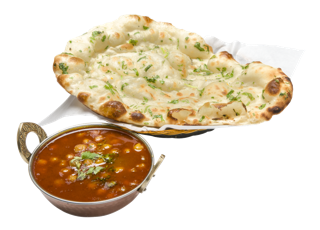 All of our naans are served with cilantro and tamarind chutneys. Leavened bread, topped with garlic. Leavened bread, stuffed with chicken, almonds, and Indian herbs. Leavened bread, stuffed with traditional Indian cheese. Leavened bread, stuffed with seasoned spinach. Leavened bread, stuffed with mixed vegetables and herbs. Leavened bread, stuffed with pesto. Leavened bread, stuffed with ground beef, ginger, onions, and a touch of cumin. Leavened bread, stuffed with seasoned spinach and homemade Indian cheese. Leavened bread, topped with sesame seeds. Leavened bread, stuffed with fragrant mint and spices. Leavened bread, stuffed with chilies, chicken, paneer, spinach and spices. Leavened bread, sprinkled with rosemary. Leavened bread, stuffed with nuts, raisins, and cherries. Unleavened layered whole wheat bread, stuffed with potatoes, onions, and fresh spices. Unleavened layered whole wheat bread, stuffed with traditional Indian cheese. Unleavened layered whole wheat bread, stuffed with cauliflower and spices. Basmati rice cooked with fresh apple, nuts, and raisins. Saffron flavored rice cooked with fresh peas and Indian spices. Basmati rice cooked with fresh carrots, cream, and saffron. A refreshing yogurt salad, made with cucumbers, carrots, and tomatoes. Traditional Indian ice cream, made of condensed milk, fresh cream, almonds, and cardamom. Traditional Indian rice pudding, cooked with nuts and cardamom. An Indian delicacy made from milk dough, fried until golden brown. Served in a honey and saffron syrup. Delicate homemade cheese patties, served in an almond-sweetened milk and cardamom sauce. A delicious Middle Eastern pastry, made of nuts baked between layers of filo dough, then steeped in syrup flavored with exotic juices. Coconut almond, chai, chocolate, mango pistachio, and vanilla ice cream are available. Pepsi, Diet Pepsi, Spirit, 7UP, Dr Pepper. Taj Mahal, Kingfisher, Royal Challenge. Stella Arois, Singha, Stone Ipa, Sierra Nevada Pale Ale, Mirror Pond, Fat Tire, Blue Moon, Kaliber Non-Alcoholic.